The man saw different types of light in his life. Sometimes the path to return from school- When the heavy cloud of rain dense shade has dropped in the field. The man suddenly stood stunned, he was surprised to see that there is nothing but different color light particles. The particles of light that are making the soil, clouds, plants like game. Seeing this diverse scene, he afraid and close the eyes. He found that the particles playing around his body. Readers can read this great book in pdf file. Shirshendu Mukhopadhyay is an eminent and most popular Bengali novelist. Here some list of his written books for adults- 'Goynar Baxo', 'Paymanta', 'Guhamanab', 'Kachher Manush', 'Jugolbandhi', 'Drishyabali', 'Kapurush', 'Kancher Manush', 'Criyabhumi', 'Tirondaj', 'Chakra', 'Jao Pakhi', 'Borosaheb', 'Naronari Kotha', 'Shyaola', 'Jhanpi', 'Charidik', ''Rangin Sanko'', 'Hatbar', 'Warish', 'Khudkure', 'Sukher Arale', 'Sampatti', 'Madhur Jonyo', 'Pipul' etc. And for children- 'Raghav Babur Bari', 'Patalghar', 'Boni', 'Bhuture Ghari', 'Ganjer Manush', 'Gojanoner Kouto', 'Hirer Angti', 'Sadhu Babar Lathi', 'Hetomgorer Guptodhon', 'Golmele Lok', etc. 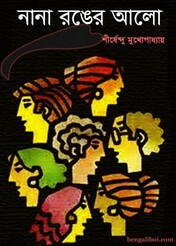 Collect or Read the Bangla ebook. Collect the Bangla Galper Boi as pdf download- 'Nana Ranger Alo by Shirshendu Mukhopadhyay'.